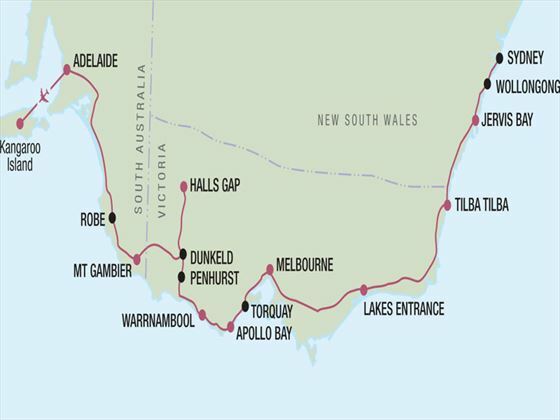 Discover the rugged coastlines, impressive National Parks, magnificent wildlife and lively cities of Australia’s south east coast on this fantastic 13 day self-drive tour. 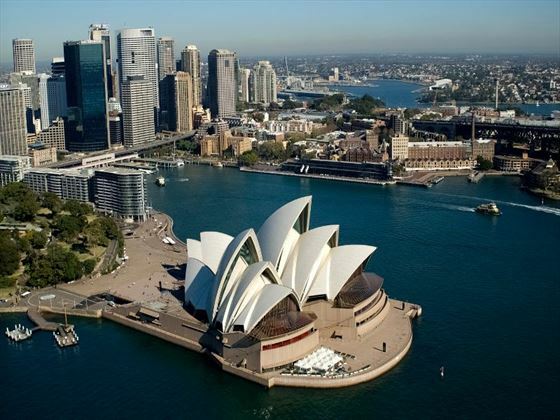 Starting in Sydney, your trip will take you through vibrant Melbourne, the animal abundant Kangaroo Island, the naturally beautiful Mt Gambier and more, before ending in the modern city of Adelaide (ATS). 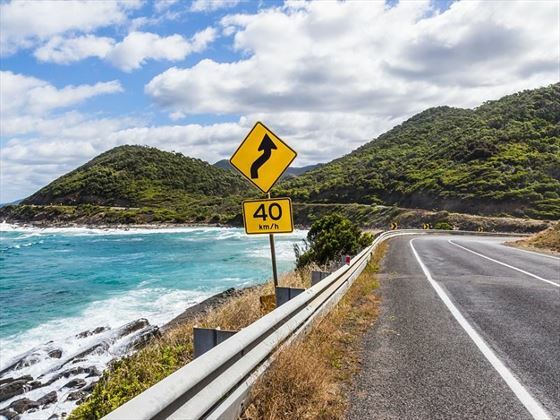 Once you’ve collected your car, you will drive south along the coast and pass through the Royal National Park – a beautiful coastal area – before continuing onto the stunning Grand Pacific Drive. 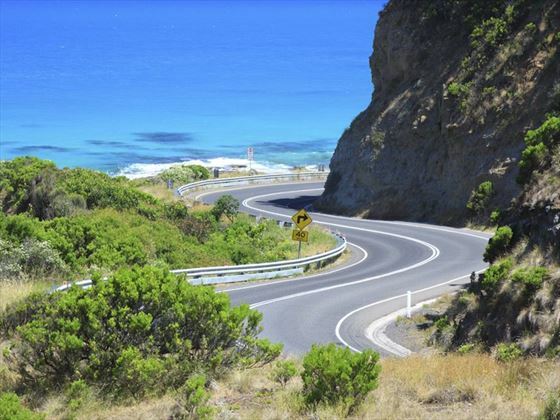 You’ll then drive across the winding Sea Cliff Bridge to Wollongong and Jervis Bay. You’ll then have the rest of the day to explore Jervis Bay, a striking area said to have some of the whitest sand in the world. Enjoy National Park views to your West and the stunning coastline to your East today as you drive along to Tilba Tilba, a charming village full of high quality arts and crafts. 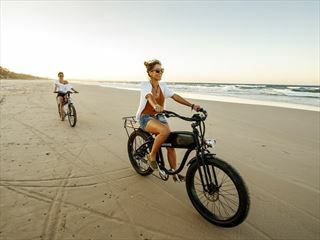 On your way to Lakes Entrance you’ll journey through multiple luscious forests, quaint towns and picturesque villages before reaching the state border. 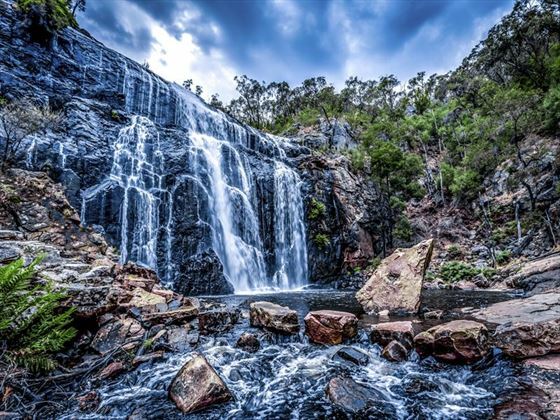 You’ll pass a myriad of incredible landscapes throughout your drive, including Sapphire Coast, Pass Cann River, and Orbost on the banks of the Snowy River, before finally arriving at Lakes Entrance. A pretty fishing port, Lakes Entrance is a popular spot for kayaking, paddle boating and fishing. 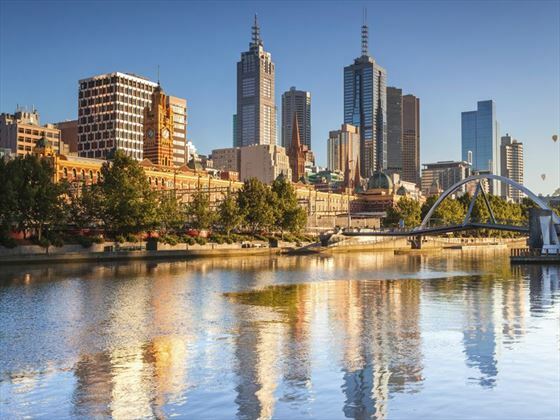 In the morning you’ll drive from Lakes Entrance to Melbourne, a lively city full of attractions and eateries. The rest of the day will be free for you to explore the city, including trying out the local cafes and wandering through Queen Victoria Market. Today you’ll have the chance to explore Geelong and Torquay; two characterful seaside towns located near the start of the breath-taking Great Ocean Road. You’ll then drive through Anglesea and the lovely town of Lorne to marvel at the cascading Erskine Falls, before continuing on to Apollo Bay. Midway along the Great Ocean Road, Apollo Bay offers a spectacular place to fish, surf, swim or dive. This day is your chance to discover even more of the wonderful Great Ocean Road, including a stop at Otway National Park, full of wonderful tropical flora and beautiful waterfalls. 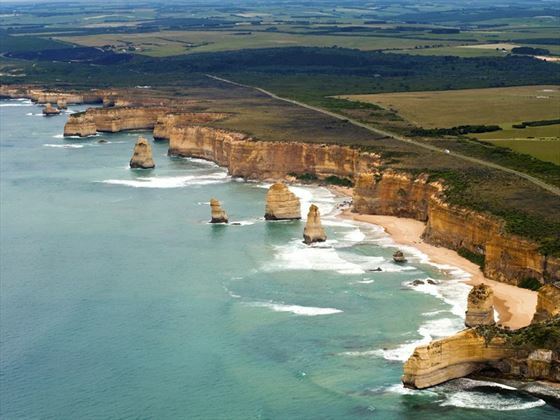 You’ll also discover the impressive rock formations of the Twelve Apostles, and visit the London Bridge. Afterwards, you’ll drive from Port Campbell to Warrnambool, a gorgeous town full of eateries, gardens, coastal views and art galleries. Today is a fantastic scenic route through Grampians National Park – a rugged area home to incredible mountain ranges, and indigenous rock art. 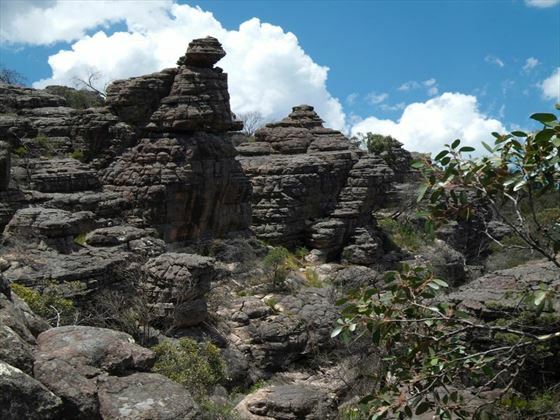 After marvelling at its natural beauty, you’ll continue on to Halls Gap. Spend a day at leisure. close by to Grampians National Park, you’ll have time to explore its jagged landscapes, with spectacular views and brilliant walking trails. The remarkable city of Mt Gambier in your port of call today, offering striking crater lakes and the lush Sunken Garden. 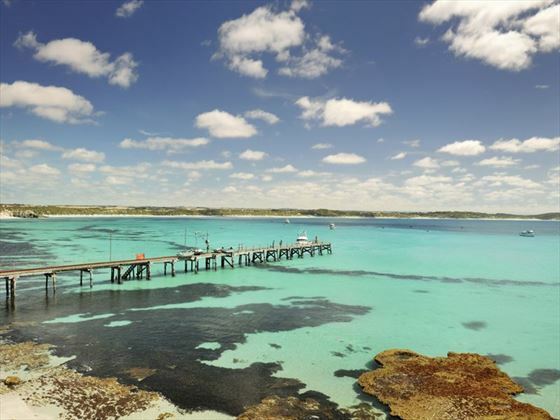 Explore the historical ports of Robe and Kingston before passing through the sweeping sandy landscapes of Coorong National Park. 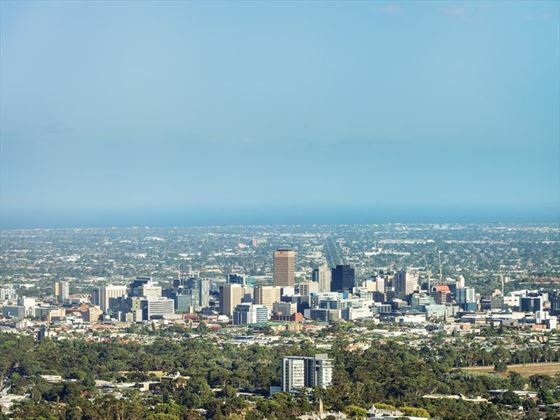 Soon after you’ll find yourself at Murray Bridge, leading you into picturesque city of Adelaide, which houses pretty architecture and fascinating museums. 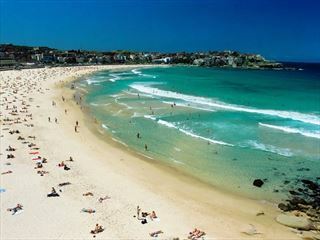 Today you will be taking a flight to Kangaroo Island. 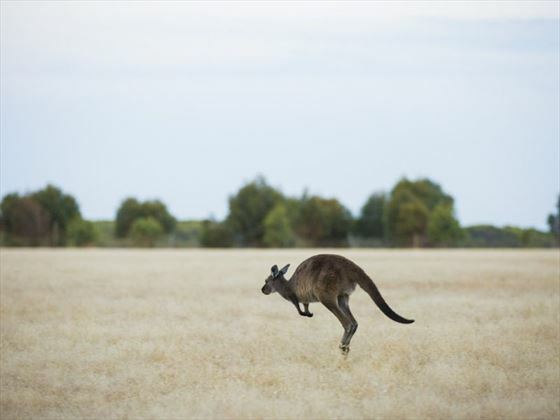 After collecting your car, you’ll have plenty of time to explore the fabulous beaches and spot elusive wildlife, including birds, wallabies, sea lions, and of course, kangaroos. The whole day is at leisure. 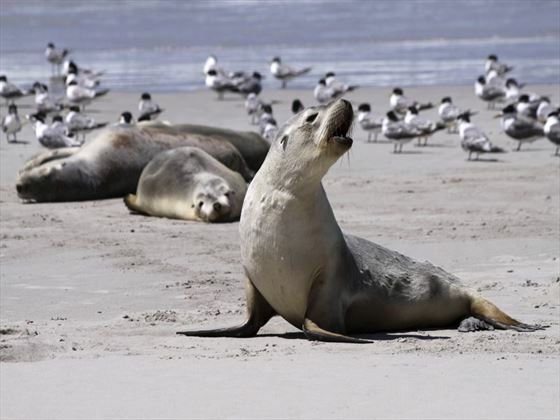 Spot more magnificent animals, venture around Flinders Chase National Park, explore the fascinating Kelly Hill Caves, enjoy the exciting ‘Koala Walk’, and visit Seal Bay to get an amazing view of the sea lion colony. 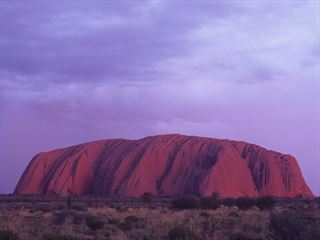 The morning will be free for you to continue exploring, before catching your flight back to Adelaide. Your car is booked until the following day, and must be dropped off at the city or airport by the same time it was picked up on day 1. Failure to do so and you will be given an additional charge.